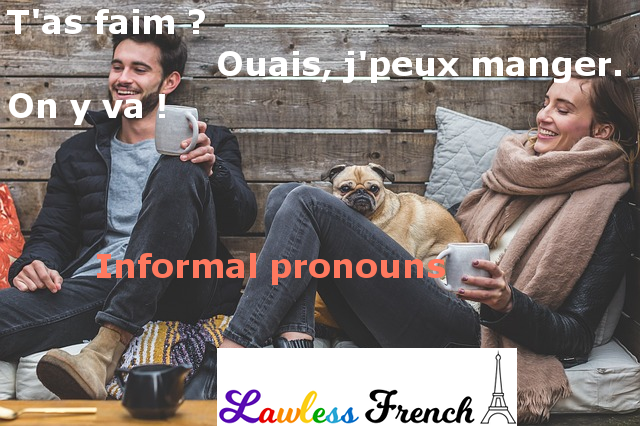 Pronoun usage and pronunciation varies greatly between formal and informal French. Much of what you learn at school is formal and doesn’t reflect how French is actually spoken. 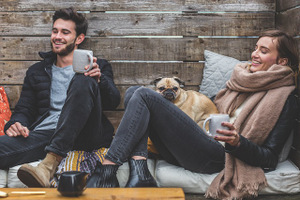 If you want to sound more French in informal situations—not to mention understand what you hear—you need to be aware of these pronoun differences. The biggest differences have to do with subject pronouns. The first person pronoun je, which normally only contracts in front of vowels and h muet, informally contracts in front of everything. * Also see informal negation. In addition, j’sais (I know) and j’suis (I am) assimilate to [ʃe] ("shais") and [ʃɥi] ("shuis"). You’re already familiar with tu, which is reserved for friends, colleagues, and kids, and affects everything from verb conjugations to certain types of adjectives. (See tu vs vous for detailed info.) Normally, tu does not contract, but informally it does in front of vowels. Tu as de l’argent ? > T’as de l’argent ? Do you have any money? > T’es prêt ? Are you ready? Qu’est-ce que tu as fait ? > Qu’est-ce (que) t’as fait ? What did you do? As the name of this lesson says, this is about informal pronunciation. The written forms are provided to help you understand how these contractions are pronounced, but they are not acceptable written forms – unless you’re actually writing an informal dialog. Nous partons à quelle heure ? > On part à quelle heure ? What time are we leaving? Nous sommes mariés depuis 10 ans. > On est mariés depuis 10 ans. We’ve been married for 10 years. The l in il and ils is silent and the resulting sound is written y or i. > I fait beau. It’s nice out. > Y sont en retard. > I sont en retard. They’re late. a) If the contraction qu’y / qu’i results, it may be written qui, not to be confused with the pronoun qui. > Qu’est-ce qu’y / qui fait ? What’s he doing? > Qu’est-ce qu’y / qui cherchent ? What are they looking for? b) Il faut may become y faut, i faut or simply faut. Il ne faut pas mentir. > Y faut pas mentir. > I faut pas mentir. > Faut pas mentir. You shouldn’t lie. > Fallait conduire. We had to drive. c) Il is dropped entirely in the expression il y a.
Il y a trop de voitures. > Y a trop de voitures. There are too many cars. Il n’y a pas de lait. > Y a pas de lait. There’s no milk. Note: when preceded by si, the l in il and ils must be pronounced, since s’i / s’y would sound identical to si. Est-ce que tu sais s’il est là ? Do you know if he’s there? Je ne sais pas s’ils viennent. I don’t know if they’re coming. An extra subject pronoun is sometimes added after the subject. > Antoine, il est sympa. Antoine is nice. > Ta sœur, elle est belle. Your sister is beautiful. Élise et Robert sont en retard. > Élise et Robert, ils sont en retard. Élise and Robert are late. David et toi venez à la fête ? > David et toi, vous venez à la fête ? Are you and David coming to the party? In direct speech, a meaningless relative pronoun que is added in front of the subject/verb, to avoid the incidental clause inversion that would otherwise be required. « Mange-ton dîner » insiste-t-il. > « Mange-ton dîner » qu’il insiste. "Eat your dinner," he insists. « Fais tes devoirs » m’a-t-elle dit Maman. > « Fais tes devoirs » que Maman m’a dit. "Do your homework," Mom said. If que is followed by il or ils, the two words contract and may be written qu’y, qu’i, or even qui (like 4a, above). « Fais tes devoirs » qu’il dit. > … qui dit. "Do your homework," he says. « On a faim ! » qu’ils crient. > … qui crient "We’re hungry!" they cry. Like il, the indirect object pronoun lui reduces to y in direct speech. « T’as faim ? » que je lui demande. > … que j’y demande. "You hungry?" I ask. « T’es dingue ! » qu’elle lui dit. > … qu’elle y dit. "You’re crazy!" she tells him. C’est is usually added after abstract subjects. Ma couleur préférée est le bleu. > Ma couleur préférée, c’est le bleu. My favorite color is blue. > La musique, c’est essentiel. Music is essential. The indefinite demonstrative pronouns ceci and cela are both replaced by ça. Tu as vu cela ? > T’as vu ça ? Did you see that? Je ne veux pas ceci, je veux cela. > J’veux pas ça, j’veux ça. I don’t want this, I want that. When verbs like communiquer, dire, donner, porter, and remettre are used with third person direct objects and indirect objects together, the former is often dropped. Je le leur dirai plus tard. > J’leur dirai plus tard. I’ll tell (it to) them later. Tu peux les lui donner ce soir. > Tu peux lui donner ce soir. You can give them to him tonight.